Many elderly adults struggle with mobility issues. Impaired balance, the effects of arthritis, diminished joint and muscle strength, lack of range of motion flexibility, and lingering effects of trauma and other health issues can make it difficult for your parent to navigate their surroundings as effectively and safely as they did when they were younger. Not only does this put your parent at greater risk of suffering injuries from accidents such as falls, it can also diminish their quality of life. An elderly adult who struggles with mobility problems might not be able to be as active as they want to be, may fear being active, and may feel limited in their enjoyment of their home surroundings. Fortunately, home health care can help. 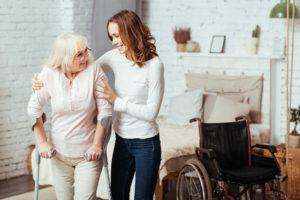 A home health care services provider can help your loved one cope with their mobility issues on a regular basis to encourage more activity and better safety. Enabling them to use more of their home and its features confidently and safely. Helping them to stay safe when they are doing specific tasks that might be challenging or dangerous, such as climbing the stairs or getting in and out of the tub. Helping them to take on more tasks such as doing laundry, tidying up, or even taking care of pets where their physical limitations can make it harder for them to handle certain elements of these tasks. Encouraging them to stay more active, which promotes better health and can preserve more mobility as they age. This can include just moving around their home more often, using the stairs rather than moving upstairs activities downstairs, and engaging in exercise on a regular basis. Home health care can be an incredible way to enhance your senior’s quality of life. As a family caregiver, you are concerned about their physical health and safety, but there is much more to giving them the lifestyle they deserve. A home health care services provider can help you to address their other needs in a way that is right for them. This can mean offering transportation so they can stay more active and engaged in the world around them. They can also encourage your parents to volunteer or participate in activities that stimulate their mind, provide social stimulation, and encourage ongoing learning. Home health care is a way to promote independence and quality of life while also relieving your stress and giving you more confidence in your senior’s well-being. If you or an aging loved one are considering Home Health Care Services in Media PA, please contact the caring staff at True Direct Home Health Care today.